Discussion in 'Economics & Trade' started by LafayetteBis, Aug 5, 2018. Above all, though, like all liberals Mill believed in the power of individual thought. His first big work, “A System of Logic”, argues that humanity’s greatest weakness is its tendency to delude itself as to the veracity of unexamined convictions. He renounced shibboleths, orthodoxies and received wisdom: anything that stopped people thinking for themselves. He wanted them to be exposed to as wide a range of opinions as possible, and for no idea or practice to remain unchallenged. That was the path to both true happiness and progress. To protect freedom of expression he formulated his “harm principle”: “the only purpose for which power can be rightfully exercised over any member of a civilised community, against his will, is to prevent harm to others,” he wrote in “On Liberty”, his most famous book. As Richard Reeves’s biography makes clear, Mill thought the coming industrial, democratic age could enable human flourishing in some ways, but hinder it in others. Take free trade, for which he was an enthusiast (despite working for a long time for the East India Company, perhaps the world’s biggest-ever monopoly). He thought free trade increased productivity: “Whatever causes a greater quantity of anything to be produced in the same place, tends to the general increase of the productive powers of the world,” he wrote in “Principles of Political Economy”. He criticised the Corn Laws, tariffs which largely benefited holders of agricultural land. Sometimes (too often) "liberalism" loses its way, and all sorts of liberal-thinking clouds the original purity of its theory. Nothing wrong with that - mankind tends to extend any thought or theory to see where it takes them. Socialism is dead, and most Europeans agree with that. Many Replicant dullards on this site however think it is alive and well - especially in Europe. They confuse socialism with social-democracy, its replacement. Socialism called for the public ownership of all the means of production and distribution. Which proved unworkable, as most of the eastern-EU countries have shown by adopting its social-democracy ethic (described in the first paragraph here). What have we learned? That government ownership of production and distribution defies a fundamental precept of Economic theory. That of Supply&Demand. Governments cannot predict Demand and with even lesser facility can they respond to it (Supply). In the Eastern-bloc countries of Europe, which Stalin had won back from Hitler, it just didn't work to balance Supply with Demand. People wanted more than they were getting. The only question remaining is, "OK, that's fine. So what about Social Democracy?" It's about this: By inserting the element of government oversight into the provision of certain fundamental elements (such as National Health Care and Tertiary Education), a Social Democracy provides essential elements of any functioning market-economy. And those "essential components" are only the most basic. 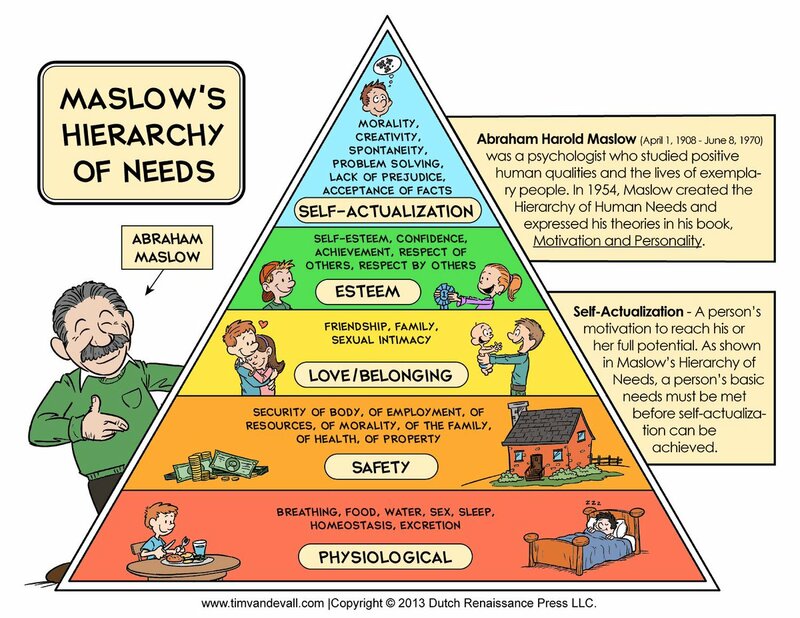 There is another way of describing the best effort of a Social Democracy, and it was portrayed by an American psychologist in the 1940s by the name of Maslow. You are posting in the economics section. 100% absurd of course since libcommie govt already provides $4.5 trillion/yr in never dreamed of stuff but oddly its never ever enough; so libcommies always want more and more until we are fully communist. Read book "It's never enough" for full understanding! The problem with deeming what is a "right" based on what people want or vote for, everything will eventually become a "necessity". Start with food, then healthcare, then phones, cell phones, computers, TVs, clothes, internet. Now, I will only deem things like healthcare and food and anything else a "right" when it is evident you are saying the government cant prevent you from getting what you want. You have a right to give yourself first aid or seek and pay for it yourself. You also have a right to hunt and consume what you kill. You don't have a right to force others to provide you with their services or the profits of their production to be given to you so you can use. You don't have a right to force others to provide you with their services or the profits of their production to be given to you so you can use. The left is trying hard to make stealing from the rich at gunpoint what democratic govt is all about! 1) that the rich stole the money they have even though people freely gave them the money they have. 2) that in a democracy the people legitimately rule even if they are thieves. 3) and that living off of stolen money wont make you less and less productive and less and less able to contribute to society. There are fundamentally Basic Rights and you have mentioned one of them, Health Care. But, there are a good many others that are not "forced upon us", but should be provided as Basic Rights. Why? Because a market-economy left to provide all goods/services to a population may not do so in a fair and equitable manner. Which is why some advanced countries opt for a public-policy of a Social Democracy (which is defined here). Crucial to any decent lifestyle, the economic statistics have taught us that Education is and must be a fundamental human right. (And America is one of the very few developed countries that does not have free Tertiary Education.) Because Education insures the comparative permanence of a higher income status of those who benefit from postsecondary education degrees. Another basic right is the ability to chose those who govern us free of any manipulation of the voting process. That right is fundamental to any Real Democracy. Which is why it should be dependent ONLY upon the result of the popular-vote unhindered by gerrymandering of voting districts or an Electoral College vote that does NOT REPORT only the results of the popular vote and none other. Since the 12th Amendment (1812), that has not been the case in the US. Both the Electoral College and Gerrymandering (also innovated in 1812 in Massachusetts) warp the outcome of the popular vote in the US. And we have continued on our merry-way thinking that since it is a constitutional amendment, it's acceptable. But, basically, neither are acceptable since they are not veritable manifestations of the outcome of an unmanipulated popular-vote. And, nobody is "forcing" anybody to "provide services" free, gratis or for nothing. Mankind invented taxation as the mechanism to assure that certain fundamental rights are indeed provided by governments. What fundamental rights? fair and equitable is exactly what Darwinian free market does. If you steal from the rich and give to the poor you reverse evolution, weaken the genetic stock, and create far more problems than you solve. It's very cruel and liberal to create weaker and more dependent human beings( for their votes) who find survival requires more and more suffering. Do you believe in science? I’ll say again, you only have a “right” to healthcare of what you can provide to yourself or what you can pay for based on what the provider is willing to accept for services rendered. You do not have the right to other people’s property or time or labor because “the majority” voted it so. You are applying a rule that belongs ONLY to a "normal market-economy for goods/services". PS: Why not appoint the same rule for police and firefighter services. Huh? Why not? In the world you live in EVERYTHING is a product or service that is obtainable only at a market-price! What colossal stoopidity! Healthcare is not "normal". It is of such a consequence to our wellbeing and lifespan that it cannot and must not be left to the rules of a market-economy. actually food clothing and shelter come first and honestly liberals want to steal always more from productive people in an effort to subvert democracy and reverse evolution. If you want to compare police and fire fighters to doctors, then they must be trained like each other. They all get straight government education, at a cost for what the government will pay, at a place which will accept that pay. Guess what, there is already a way to get medical schooling paid for and work for less than what other typical doctors get paid, it’s called the military. But even still, the best cops can go free lance and do private security, and make more than ordinary cops, to people who will pay more for better care. You also point out a great reason why health care shouldn’t be treated like other government agencies, cops aren’t there for everyone, not enough to go around. Neither are there enough fire fighter. You think there will be more or less doctors working for the rates the government will pay? Do you think there will be more or less use of dwindling government doctor supply? Do you think the doctors will never try to game the system by charging the government with procedures they never preformed? The last question already happens btw in the government subsidized programs like Medicare and Medicaid. It’s only caught if the patient looks through their mail efficiently and brings a complaint against the doctor. China just switched to what you call "market stupidity" and instantly eliminated 40% of all the poverty on our planet. That is stupidity only to a liberal, a liberal who is blinded by his desire to leech off the system rather than contribute to it.